Do you have a pet hamster that you love almost as much as you love your own kids? Hamsters are adorable creatures and the perfect pets. If you want your hamster to stay happy and healthy, then you should definitely be investing in toys for your little fur buds. Just like most pets, hamsters are creatures of the wild. They are used to a certain way of life, but that gets changed when they move into a human’s home. Even if they are bred in labs, they do have their natural instincts in their DNA. The main change they have to face is the lack of activity in domestic places compared to the wild, and also the different habitat overall. Hence, it is mandatory that you provide them with toys which will keep them active and give them a feel of their natural habitat. Let’s be honest here, everyone at some point of time in their lives have been a fan of the Zhu Zhu pets ever since they were released in 2008. If you’ve they always wanted to have your own Zhu Zhu hamsters, now is your chance to check out this amazing set! Also, we can all relate to that one time our children or younger siblings threw a fit and begged for a pet in the house. If your kids are absolutely in love with hamsters but you are not allowing them to get one as a pet, we completely understand. Having a pet is a huge 24/7 responsibility that comes with multiple chores. As a solution, you can consider buying this amazing toy set. This set will give them the full fun experience of playing with hamsters without actually having to deal with all the hassle that comes with a real live one. It’s really a win-win for both. 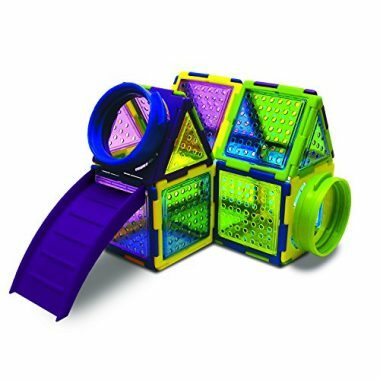 This plastic set comes with a hamster house, slide and tunnel that have to be put together before use. 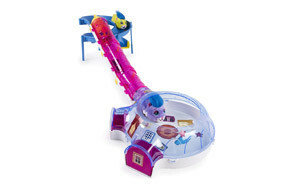 It also contains a winkie hamster which slides down the slide and moves around, plus 2 batteries are included as well. Customers have reviewed that connecting the set and making it stay connected can be a bit of a hassle sometimes as some movements cause the parts to get loose and consequently fall down. 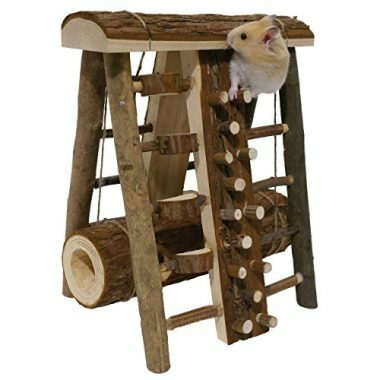 Looking for something that will fulfil your little hamster’s desire of climbing things all the time? Named as the “activity assault course”, this toy does give the feel of a military training post just like the ones soldiers use to practice their climbing and hanging skills. The setup is quite big, so make sure you have a big open air playpen from which your hamster can’t escape. You will not be able to use this inside most bin cages that do not have lids, or smaller cages either. You should also consider your hamster’s size before buying this since hamsters come in all sizes. For example, dwarf hamsters will not be able to climb it easily, while Syrian hamsters will not fit into the log. Customers have reviewed that it is very easy to assemble and the parts stay in place with the glue (unlike most flimsy toys that fall apart due to low quality glue). 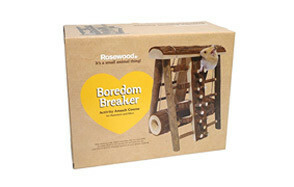 It is made from chewable and harmless wood so you need not worry about your hamster’s digestive health. When you’re buying hamster accessories, hamster chew toys are great options. Due to the ever-growing incisors of hamsters, they are constantly chewing on whatever they find, which ultimately helps to wear down their teeth. Kaytee’s tiny chew toys serve this purpose very well. 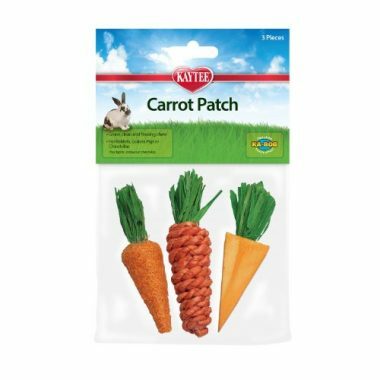 This set is the carrot patch variety. Even though the pack says it is primarily for rabbits and chinchillas, they have been reported to be way too small for rabbits, which make them all the better for hamsters since they are much smaller than rabbits anyway. The pack says it’s meant for gnawing, cleaning and flossing, and we have found that they absolutely do live up to their promises. However, we would advise you to be careful about the glue. Some customers have reviewed their packs came stuffed with hot glue, which can prove to be very harmful to your Syrian or dwarf hamster. On the other hand, we have seen these to be huge hits with dwarf hamsters, and can even be used as gerbil toys! What’s better than 3 chew toys in a pack? 5 chew toys! When you have a hamster in a house, you’re going to get accustomed to constant chewing and gnawing. These are their favourite jobs and therefore you have to make sure the things they are chewing on are safe for them. 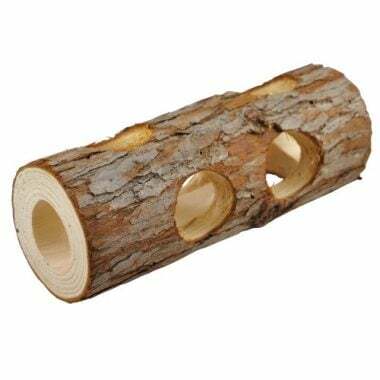 This is why this pack of 5 toys is definitely one of our favourites as the toys are of really good quality wood which is perfectly safe. They can be a bit big as Russian dwarf hamster toys, but that shouldn’t be much of an issue as all 5 things are of different shapes and sizes. 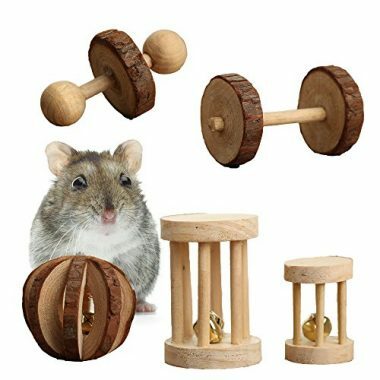 This versatility ensures that hamsters of every size enjoy their time playing with these toys. However, their use is not only limited to hamster toys, they can easily be used as gerbil or rat toys as well. And obviously, the more the merrier! At least you will not have to worry about repurchasing as soon as 1 gets worn out. At the end of the day, you will still have 4 more available. Can be used for hamsters, gerbils, rats. Chinchillas, guinea pigs etc. 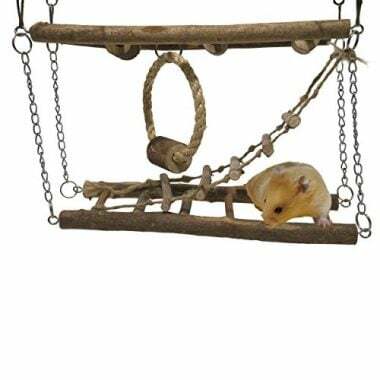 This unique toy hangs from 4 points and sets up like an actual suspension bridge, which makes it quite adventurous for tiny hamsters. It’s not just any small flimsy toy that you can fit anywhere, so you will definitely need a big cage or playpen to set this up. The material is pet safe wood, hence your hamster can chew on it as much as they want. Alongside the ladders, it also has a hanging hoop type thing that your little furry friend will adore. One huge advantage we have found is that this toy is greatly customizable. Even if the whole thing together does not match your needs perfectly, you can easily use the parts separately in different places. All in all, if you have any interest in buying hamster stuff, this one is a must-buy. Who among us doesn’t like to see a neat and tidy hamster cage? Most of us probably don’t like to see that kind of mess with several chew toys lying around here and there. However, that does not mean your hamster does not need a source of entertainment! In such cases, if you have a bit of space to spare, then you can definitely consider buying this pet hammock. Why should humans be the only species enjoying hammocks, after all? This hammock is quite big, sufficient to hold your hamster well enough that it can sleep comfortably in it. It’s not only a toy but bedding as well. It has a hole in one side, so your hammy can get the feel of peeking out of a tunnel. Customers are incredibly happy with this product, and they have rated the fabric as really high quality. It hangs from 4 sturdy chains which are anti-rust and corrosion resistant, and you can easily hang it from the top or roof of the cage. Make sure you have adequate space to hang it from a good height since hamsters LOVE climbing. 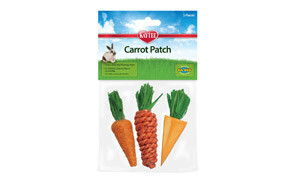 Can be used to house squirrels, hamsters, chinchillas, rats, guinea pigs, rats etc. Are you a puzzle person? Would you like to invest your time into making something fun and creative for your furry friends? If you have the patience to assemble a jungle from many small pieces, then this puzzle playground will be something that both you and your hamster will love. Talk about some real pet-owner bonding here! However, we will have to give you a precaution before you run to grab this: you MUST have patience. Assembling this playground is not exactly difficult, but it is definitely time-consuming. It’s not rocket science but you might have to be a bit intuitive about using additional glue where needed to hold the pieces in place. One advantage is that you can actually combine multiple sets to make a gigantic playground, so let your imagination run wild regarding how you want to set it up! Hamsters love it. They love the tunnels and the slides and the holes. They love everything about it. But, you should consider your hamster’s size before buying this as big teddy bear hamsters or even big Syrian hamsters might not fit very well. But if it does fit, and if you do somehow complete building one, then you will surely have a very happy hamster! As we have mentioned previously, hamsters just love tunnels as it represents their natural habitat. So, what could be a better toy for them than a tunnel tube toy? 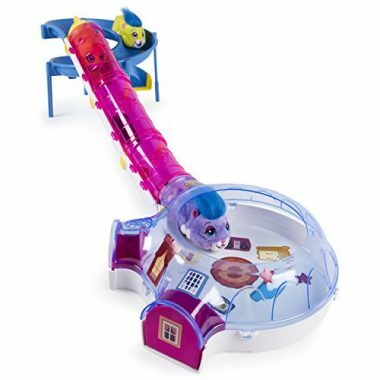 This tunnel tube has 9 exits, and it drives hamsters ABSOLUTELY crazy! They keep entering, exiting, poking their noses out, trying to climb the walls and what not. Especially great as a hamster house toy, you can put this in their cage and forget about it as they can easily sleep in it as well. The material is extremely soft and safe for chewing, so there is nothing to worry about. If you have a fatter than usual Syrian hamster, then the problem you might face with this tunnel is that it might not be able to enter fully. Even then, you can use it to hide treats in the hole openings, which the hamster can easily retrieve. Even if they cannot enter fully, hamsters do love peeking into tiny holes. Rosewood strikes again! With their third and final product on this list, we have to admit that even we’re surprised at how many awesome hamster toys they have. Not only are these toys extremely fun for your hamster, they’re incredibly cute as well. And this rainbow play bridge definitely tops the list in terms of cuteness. With a rainbow painted on the side, the wooden play bridge will brighten up any cage and fill it with colour. A feature of this bridge is that due to its arch shape, it forms a tunnel underneath it. Hamsters enjoy playing in that tunnel as they are accustomed to building and living in their own tunnels in the wild, and so they get a feel of their own environment. Alongside, we have seen many hamsters fall asleep peacefully in that tunnel, so it serves as bedding too. Customers just love this bridge and we are yet to find anything negative about it; other than it might be a bit small for bigger Syrian hamsters. Since the wood is chewable, you don’t have to worry about your hamster’s digestion either! The chewing also helps to keep the ever-growing incisors in check. This is not a major concern for other pets, but when you are taking care of hamsters, mice, gerbils or any other small pets that like chewing, you have to keep this in mind. Hamsters have 2 pairs of sharp incisors (one in the upper jaw and one in the lower jaw) that continuously keep growing throughout their life. Hence, for their own comfort and well-being, they constantly keep chewing on things so that their teeth are worn down on a regular basis. Hence, when you tame them and keep them as pets, you have to be prepared for a whole lot of chewing on anything and everything they find. Which is why you have to make sure that WHATEVER you keep near your hamster is chewable and will not harm or hamper their digestion in any way. It is better to have softer items rather than harder ones (their teeth might get hurt) and it should definitely not be toxic in any way. Is the material/toy comfortable for them? Since they love running around and chewing about, you have to make sure the toy does not have protruding or sharp edges that might hurt them in any way. Also, take the size and shape of your hamster into account. Do not make baby hamsters play with toys that have large holes as they might fall through them, and do not make fat hamsters play with toys that have too small holes for them as they might get stuck. Well, first of all, toys will be really beneficial for your hamster’s health. Since they are not living in their own habitats, they are not getting their regular exercise which they would have gotten in the wilderness. In the wild, hamsters are accustomed to hunting for their own food by going huge distances, hence they never get bored nor do they become unfit. But in domestic homes, they do not have that much to do hence the lack of activity might make them fat or diseased. Moreover, since they are crepuscular, they will be active when you are asleep so having toys will help them stay active even when you are not around. Hamsters love running, which makes them stay fit and not become fat. Alongside, their incisors are something you always have to think about. Having chew toys around ensure that their teeth are not getting out of control, which would otherwise hurt them and make them very uncomfortable. Q: What is the best playtime for my hamster? A: Hamsters are crepuscular, hence their day starts after sunset. It is best not to wake them up before a complete sleep cycle or they might bite. Even if you are very tempted to play with your beloved hamster, you have to understand that hamsters are that way due to their genetics and you cannot change it overnight. However, if you see that your hamster is staying awake during daytimes, then you can play with it in the daytime too. Q: How far does a hamster run? A: Well, a lot. According to Wikipedia and other sources, a hamster can run up to 9 km per night, or 5.5 miles. The reason behind this is simply their nature and instinct. In the wilderness, hamsters run a lot in search of food. They have to go huge distances to find something suitable for eating while not getting eaten by their own predators. This is why it is quite important to have a hamster wheel in its cage. Running keeps hamsters healthy and motivated, and what better way to achieve this than the good old hamster wheel? Q: How often should I change my hamster’s chewing toys? A: Since hamsters are always chewing, their toys will eventually becoming too ragged for them to chew anymore. You will notice that they have stopped chewing on them or are ignoring them completely, and so you will know that it is time to change chew toys. On another thing you should remember is that chewing a lot on a toy might make it unhygienic at a point. Think about it, the constant chewing is making it wet, which might eventually turn into a breeding place for microorganisms. Hence, in our opinion, you should change the chewing toys at somewhat regular intervals of a few months. Q: Can I let my hamster play outside the cage? A: Yes, you can. Just make sure that you are being careful. Hamsters are tiny creatures that might get lost or even escape if you are not careful with them. When they are out of their cage, make sure they stay in a room under your supervision, and that all sorts of exits such as doors and windows are closed. Also, make sure that there are no hiding places such as vents or coolers around where your hamster can hide and eventually get injured. Q: How often should I play with my hamster? A: Hamsters-or any pet for that matter- are like babies who need attention. Having said that, there are no minimums or maximums to how much you can play with your hamster. Hamsters have their own way of telling you that they want to play, so make sure you are there for them then! 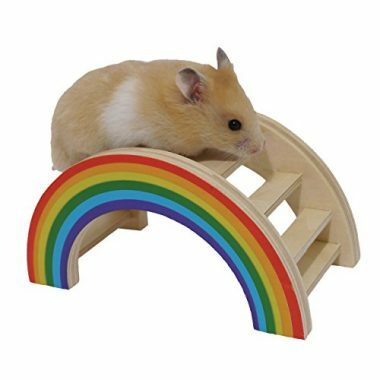 In our opinion, good old rainbow Play Bridge is the best hamster toy out there. Not only is it incredibly safe, it is also very easy to assemble. Hamsters can safely climb up and down without worrying, use the bottom part as a tunnel AND sleep in it as well. On a whole, we found no cons of this toy hence it wins our first prize.